Will Mourinho’s third season syndrome strike again? Everyone knows the pattern: Jose Mourinho joins a club, creates an immediate impact and enjoys sustained success, but the cracks slowly start to appear, as his combative, abrasive management style causes friction and resentment amongst his squad, inevitably leading to his departure from the club in his third season. It’s repeated that often that it feels like it’s an established truth. But is it? After brief spells at Benfica and União de Leiria, Mourinho’s first long-term management role was at Porto. He introduced a more scientific training regime, and built a typically physical and powerful team who pressed high up the pitch. It was an aggressive approach that brought immediate results, winning the title in his first season by 11 points. The retained the league the following year, and won the Champions League as well. It was a trajectory so remarkable that it attracted the attention of Roman Abramovich. There was no third season syndrome at Porto, as Mourinho left the club to join Chelsea. It’s fair to say Mourinho made some entrance to the Premiership. Declaring himself to be the special one, he instantly won back-to-back titles, creating a team infused with power, pace, and guile. Into season three, though, and his relationship with Abramovich began to unravel. It seems, though, that this was more attributable to the Russian than Mourinho, with the manager angered by Abramovich’s signing of Andriy Shevchenko against his wishes (and the owner’s repeated insistence that the Ukranian should be in the starting line-up), and the appointment of Avram Grant as director of football. 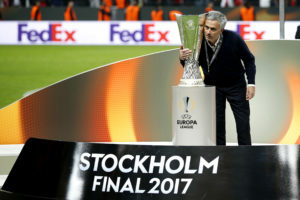 Considering that the owner’s intrusive actions would antagonise most mangers, it seems disingenuous to claim these issues were primarily the fault of Mourinho, and notably there was no falling out with his players, who had another strong season, and only just missed out on winning the league again, this time to United. Mourinho left in September of the following season, although again it was due to disagreements with the owner, rather than the playing staff. The way Abramovich has continued to fall out with managers ever since tends to mitigate Mourinho’s role in the problems at the club at that time. At Inter Milan, he once again won the league in both of his first two seasons, including a treble in his second year. Again, there was no third season syndrome, as he was appointed Real Madrid manager that summer. Mourinho’s Madrid fell just short of Barcelona in La Liga in his first year, despite finishing with 92 points. Typically, he won the league in the subsequent season. In his third year, Mourinho did have issues with some of the players, particularly Ramos, Casillas, and Ronaldo. It was when Mourinho notably became more defensive; resistant and unwilling to accept any criticism, however justified. He left Madrid at the end of season, although his relationship with the club was nowhere near as toxic as is often reported. Also, three years at Madrid, much like at Chelsea, is fairly typical for a manager at the club, and perhaps even longer than most. So no third season at Porto and Inter (due to his success), and three largely successful seasons at Chelsea and Real Madrid. It is clearly not the destructive pattern the media likes to portray, and a closer examination of his career confirms the notion that it all falls part in his third year, while containing a few elements of truth, is mostly tenuous and misleading. Will Mourinho be able to add another trophy to Manchester United’s cabinet? Mourinho’s main problem was in his second spell at Chelsea, when after winning the league in (unsurprisingly) his second season, it all went wrong very quickly. He won the league in May, was awarded a 4 year contact in August, and sacked in December. It was a dramatic and public fall from grace, and the volatile way he clashed with the players, the owner (again), and, famously, the club doctor (Eva Cerrario), meant that Mourinho’s 3rd season syndrome that had been nothing more than a flimsy theory suddenly became the established truth. The reality is that Mourinho’s career history is very similar to many other managers. Short-termism is common, and long-term managerial appointments have become increasingly rare. The idea that he will inevitably self-destruct in this third season is a myth. It happened once, at Chelsea. There’s no pattern, no pre-destined sequence, no certainty that his third season at United will end badly. Mourinho currently casts a negative and dejected figure, and is clearly unhappy with both the board and some of the players. But that can change. He needs to step up, and so do his players, for it will be them, and not history, that determines the success of this season.